It seems like forever since I've been able to take time to pay attention to my blog. That real job, the one that pays the bills, has been eating up my time and it's been a good couple of months since I've been able to do anything for myself. Back to school time is always busy as we get back into the routine, but this year has been especially hard. It's good to know that it isn't only me though. It seems that every teacher in my school is feeling the same way and while we were out trick or treating I got to talk to one of my teacher neighbors and she said everybody in her school is feeling the pressure too. It just seems that more and more responsibilities are being put on school teachers. We no longer are allowed to just teach and take care of our students, but instead we have paperwork overload, new assessments to implement, hoops to jump through, and the list goes on and on. The powers to be in Washington think up these ideas and then push them on the state, the states then push them on our superintendents, they push it on administration, and administration then puts it on the teachers, and there it rests. We don't get to push the buck on. Other than the students, we don't have the option to put it on anybody. And being the teachers that we are, putting our students first, we are doing everything in our power to not stress them out and keep their education at the forefront of everything we do. So instead of coming home at night to work with my own kids, spend time with the family, or do something for myself, I'm planning lessons, grading papers, doing research, completing paperwork, and just trying to keep my head above the water. All for what? I'm not getting paid by the hour so I definitely don't see it in my paycheck, I'm not getting an trophies, no special perks. No, I'm doing it for my students. Because while the powers to be that are sitting in their offices in the sky thinking up these ridiculous programs, I'm in the classroom making a direct difference in 20 peoples lives. I'm listening to their stories about mom and dad not being home to tuck them in because they had to work, how they didn't have dinner last night, I'm bandaging the paper cuts, teaching them social skills, building their confidence, encouraging their imagination, playing mom, nurse, friend, and oh yeah...TEACHER. I know what I do makes a difference and that is the only thing that has kept me going this school year. 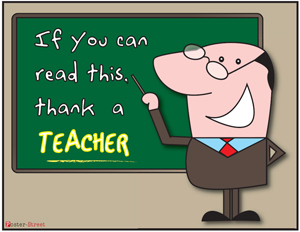 I encourage you to take time to thank a teacher today. Teachers don't do it for the money, or the recognition, or the awards...they do it because they truly love YOUR child and want to see them succeed in life.